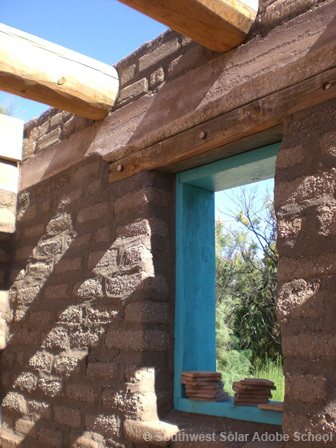 This entry was posted in Adobe, Calculating Building Costs, Construction by josephtibbets. Bookmark the permalink. I have to wonder why the cost isn’t even cheaper really. I mean, perhaps start a co-op with CDL drivers and poor old Detroit, Michigan with all those vacant houses with windows, wood and fixtures? Just move it South, “waste not want not” sort of thing. And with the off-grid solar power wars going with fossil fuel power companies in the news of late, why not whole communities with their own power grid, underground, out of sight. I read the cost per square foot discussions with interest. I was the owner/builder of a 2000 sq ft passive solar adobe just outside Magdalena back in 78. I started in 78 and we moved in in 1980. When I calculated the total costs (land/well/elect service, materials and labor for the electrician and plumber and various helpers) for my tax returns I came up with about $45,000 or a bit over $20 a ft. Those were definitely the good old days. When we had to move I sold the house for 65,000 and thought I had done well (wish I had been able to keep it). In the late 90s I saw the house advertised in NM Magazine for $250,000. The new owners have made many improvements and the house should last many/many more years.